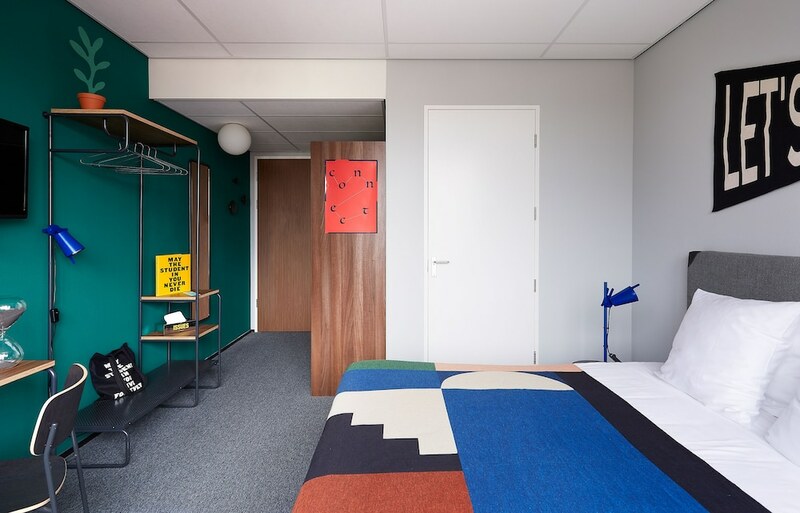 With a stay at The Student Hotel Amsterdam West in Amsterdam (Nieuw-West), you'll be within a 15-minute drive of Vondelpark and Ziggo Dome. This hotel is 2.5 mi (4 km) from Anne Frank House and 3.1 mi (5 km) from Amsterdam Museum. Stay in one of 700 guestrooms featuring flat-screen televisions. Complimentary wired and wireless Internet access keeps you connected, and cable programming provides entertainment. Conveniences include desks and blackout drapes/curtains, and housekeeping is provided daily. Enjoy recreational amenities such as a fitness center and bicycles to rent. Additional amenities at this hotel include complimentary wireless Internet access and a television in a common area. Satisfy your appetite at The Commons, a restaurant which features a bar. Dining is also available at the coffee shop/café. Buffet breakfasts are served on weekdays from 7:00 AM to 10:30 AM and on weekends from 9:00 AM to 11:00 AM for a fee. Featured amenities include a 24-hour front desk, multilingual staff, and laundry facilities. Limited parking is available onsite.